You can see my wrap-up for May here. 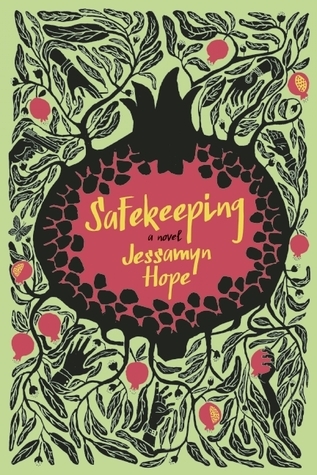 I'm currently reading Safekeeping by Jessamyn Hope. It's an absolute jewel. 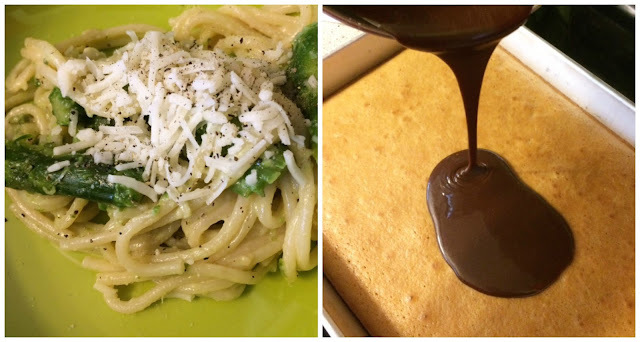 Two of the hits of the week were Pasta with Asparagus and a glorious Peanut Butter Cake with Chocolate Icing. Now that the weather is turning warm I'll be looking for good salad recipes. Do you have a favorite? We had my youngest nephew come for an overnight visit last week. It was fun (and exhausting!) to have a little one around again. We fed the baby geese at a local park, went to the candy store, and watched a lot of Curious George. 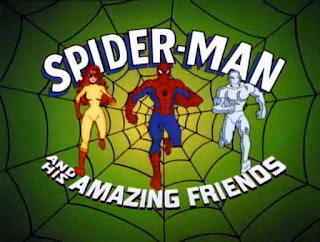 I discovered that my favorite animated Spiderman series is on Netflix. It flings me back in time and makes me feel like I'm sitting cross-legged on the floor with a bowl of Lucky Charms on a Saturday morning in 1982. Awesome. I've been blurbed! Thanks to Anthony Breznican and the good folks at St. Martin's Press. 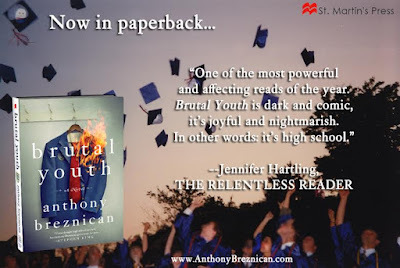 I'll be picking up a paperback copy of Brutal Youth soon so I can see it in person. You may have seen my campaign earlier in the year to put up a Little Free Library. It became a reality late in May when I was finally able to install one in my front yard and fill it with books. If you're local I invite you to come on by and take a book, leave a book, or both! Come hang out with me on Facebook, Twitter, and Instagram! What's going on with you? What are you watching, reading, cooking? I'd love to know! Watching? The new SpongeBob movie. Reading? The latest Longmire book by Craig Johnson. Cooking? Omelettes. That's all about I know how to cook. :) ...for now. The pasta with asparagus recipe looks divine! Love your Little Library. I have one in front of my house, too, and I won a grant last year to build five for my town. They are built but I'm still contemplating where exactly I want to place them. I'm pretty jazzed about it! Isn't that cover something? It's gorgeous and the insides are even better. Hi, Jennifer. It makes me so happy to see Safekeeping described as "an absolute jewel." I don't know where you live in Wisconsin, but my dad lives in Appleton, and I went to Lawrence University. I will be a part of an author panel at the Appleton B&N on June 20th. If that is anywhere in your vicinity, it would be an honor to sign your book. I'm so glad you stopped by to comment, Jessamyn! I enjoyed your book so much. I wish that I was closer to Appleton. I'm way up in the northwest in Hayward. Hey, if you ever feel like taking a road trip north of Eau Claire let me know, ha ha! Of course she does, she's an awesome kid! Mike has stopped watching it and now I guess I'll have to plow on alone...sniffle. 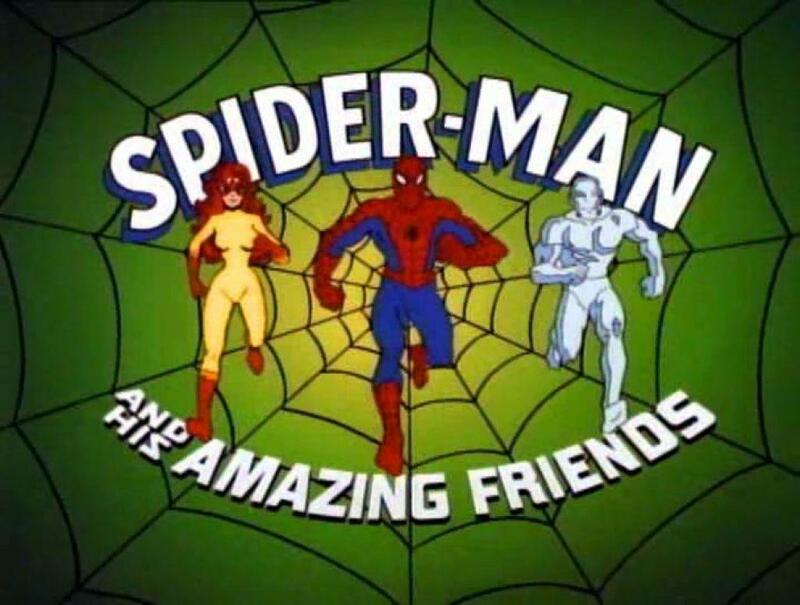 I tried the Spiderman cartoons on Netflix, they were cute. Your food posts always make me a little too hungry and I'm jealous of that candy store, too! Greyson is in love with Spiderman and His Amazing friends, and it makes David and me so happy! A throwback to our childhoods. I've also been lusting after that Pioneer Woman cake for AGES. Was it as good as I expect it was? I'm so glad he likes it! :D All the cool kids do! Yummy, yummy looking pasta with asparagus. Will check that recipe out for sure. I like salads with romaine and a little toasted pecans, a little blue cheese, a little dried cranberries or dried cherries, some chopped apple or pear or even peach this time of year, a little celery, and you can eat it like that or add some leftover grilled chicken. With your dressing of choice. Love it! Oh yes! I love my salads to have a little bit of sweet. I usually toss in a handful of raisins. Mmm! Now I'm hungry for a big salad and it's 9AM, lol. I'm toying with the Little Free Library myself, not at my house though as it would not get much use. I'm thinking of setting one up at the local college where I work. That is so cool that you're blurbed on Brutal Youth! Congratulations! We made pasta with asparagus this week and the whole family loved it! I'm sad asparagus season is almost over because I can see that one being very popular and made often. I haven't visited your weekly wrap-up for a while. I always love your updates. I make a salad with diced: tomatoes, cucumbers, and red onion. Add shredded carrots, black olives, feta, and balsamic vinaigrette. Chill. Takes a while to do the chopping but stays good for a couple days. Perfect as a side or main! Will keep trying. The recipes look good too. Thanks! Yay for the blurb! the LFL is adorbs. I keep saying I'm going to do this but then I'm like...do I have the energy to keep this up? Maybe I can convince Sandie to help me with it. I'm hoping that it will become self-sustaining at some point. It's not like I don't have a boat load of books to share though, lol. A lot of new stewards are hustling for books and I'm thankful that I don't have to worry about that ;) I think it would be a great idea to have a Little Free Library buddy system. A LFL team!